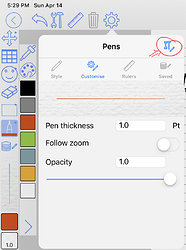 ZoomNotes: How do you set it up? I have also used it before, but I find that I’m still reeling from the number of options and tools. I don’t really have enough motivation to dive into it because handwriting on the iPad is not a frequent workflow for me. However, it is nice to do in certain situations and I find the “infinite canvas” approach in zoom notes very useful. What tools do you find essential? Which do you hide away? And, maybe most importantly, how do you draw simple sketch shapes without invoking the “smart” shapes that are hard to manipulate? I mainly use a template (gray grid on black) for most uses(1), or the infinite canvas. I keep the tools out of the way and have configured a few colored pens, set to 1.0 thickness This is enough for the majority of what I do in ZN. The table tool is fidgety, I find it difficult to work with. The eraser of course is essential. As is the selection tool. Text tool is OK, but I don’t type much so it gets little use. I don’t use the stamp tool a lot, but I have a few custom stamps that are useful for some subjects. And I use links from time to time between pages or between documents. The snapping tool doesn’t get much use. To turn off shape detection, click the gear then click the icon in the upper right corner. This takes you to the menu where the control to turn off shape detection lives. (1) I often take notes in white ink on black – for some reason the notes are easier to read. I switch to red or green ink to emphasize points, indicate actions needed.